The 2015 Term of the Supreme Court just ended. Next Term. the Supreme Court will review two potentially significant immigration cases. Both implicate significant doctrinal issues of immigration law that have perplexed the courts for many years. The Solicitor General sought review of adverse lower court decisions in both cases. Issue(s): (1) Whether aliens seeking admission to the United States who are subject to mandatory detention under 8 U.S.C. § 1225(b) must be afforded bond hearings, with the possibility of release into the United States, if detention lasts six months; (2) whether criminal or terrorist aliens who are subject to mandatory detention under Section 1226(c) must be afforded bond hearings, with the possibility of release, if detention lasts six months; and (3) whether, in bond hearings for aliens detained for six months under Sections 1225(b), 1226(c), or 1226(a), the alien is entitled to release unless the government demonstrates by clear and convincing evidence that the alien is a flight risk or a danger to the community, whether the length of the alien's detention must be weighed in favor of release, and whether new bond hearings must be afforded automatically every six months. This immigration detention case will give the Court the chance to address immigrant detention, which has skyrocketed since 1996 immigration reforms. The Obama administration has employed detention as an immigration enforcement tool and some immigrants have been held in detention indefinitely pending removal. Because some nations have refused to accept some immigrants subject to removal, some immigrants have been indefinitely detained. The circuits are split and the Supreme Court has decided a number of immigrant detention cases (Zadvydas v. Davis (2001) and Demore v. Kim (2003) in somewhat inconsistent fashion in the post-1996 era. Indefinite detention without bond possibilities are unheard of with respect to criminal defendants. The lower courts have reached different conclusions on immigrant detention issues. Issue(s): (1) Whether Congress's decision to impose a different physical-presence requirement on unwed citizen mothers of foreign-born children than on other citizen parents of foreign-born children through 8 U.S.C. 1401 and 1409 (1958) violates the Fifth Amendment's guarantee of equal protection; and (2) whether the court of appeals erred in conferring U.S. citizenship on respondent, in the absence of any express statutory authority to do so. The Second Circuit agreed with Morales-Santana that the gender distinctions in the derivative citizenship provisions was unconstitutional. The Supreme Court has been sharply divided on the lawfulness of gender distinctions in the laws granting citizenship to children. See, for example, Flores-Villar v. United States (2011) and Nguyen v. INS (2001). Besides the issue of gender stereotypes, Morales-Santana implicates the venerable plenary power doctrine , which historically has shielded the immigration laws from judicial review. Although there have been "cracks" in the doctrine, it remains largely intact. (3) whether, in bond hearings for aliens detained for six months under Sections 1225(b), 1226(c), or 1226(a), the alien is entitled to release unless the government demonstrates by clear and convincing evidence that the alien is a flight risk or a danger to the community, whether the length of the alien's detention must be weighed in favor of release, and whether new bond hearings must be afforded automatically every six months. The Ninth Circuit, in an opinion by Judge Wardlaw, affirmed in part and reversed in part the district court's order granting summary judgment and a permanent injunction in a class action lawsuit by non-citizens within the Central District of California challenging their prolonged detentions under civil immigration detention statutes 8 U.S.C. §§ 1225(b), 1226(a), 1226(c), and 1231(a) without individualized bond hearings or determinations to justify continued detention. The panel affirmed the district court's permanent injunction insofar as it required automatic bond hearings and required Immigration Judges to consider alternatives to detention. The panel also held that IJs must consider the length of detention and provide bond hearings every six months for class members detained longer than twelve months, but rejected the class's request for additional procedural requirements. The panel held that subclass members subject to prolonged detention under mandatory detention statutes §§ 1225(b) and 1226(c) are entitled to bond hearings, and that subclass members subject to discretionary detention under § 1226(a) are entitled to automatic bond hearings after six months of detention. In an issue this court had not previously addressed, the panel held that the government must provide periodic bond hearings every six months. "The court of appeals' ruling also solidifies an acknowledged split of authority among the circuit courts of appeals. See Lora v. Shanahan, 804 F.3d 601, 614 (2d Cir. 2015) (describing the split and collecting citations). The Second Circuit has recently chosen to "follow the Ninth Circuit" and adopted the "bright-line approach," requiring bond hearings by the six-month mark for aliens detained under Section 1226(c). Lora, 804 F.3d at 615-616.6 By contrast, the Third and Sixth Circuits, while taking the position that detention without a bond hearing under Section 1226(c) is limited to a "reasonable" time, have squarely rejected the rigid six-month rule and instead assess reasonableness based on a case-specific balancing inquiry. See Ly, 351 F.3d at 271-273 (rejecting a ''bright-line time limitation"); Diop v. ICE/Homeland Sec., 656 F.3d 221, 233 (3d Cir. 2011) ("We decline to establish a universal point at which detention will always be considered unreasonable. "); see also Leslie v. Attorney Gen. of U.S., 678 F.3d 265, 269 (3d Cir. 2012) (discussing "[t]he fact-dependent inquiry"); Chavez-Alvarez, 783 F.3d at 474 ("By its very nature, the use of a balancing framework makes any determination on reasonableness highly fact-specific.")." ABSTRACT: Are we on the verge of an apartheid by algorithm? Will the age of big data lead to decisions that unfairly favor one race over others, or men over women? At the dawn of the Information Age, legal scholars are sounding warnings about the ubiquity of automated algorithms that increasingly govern our lives. In his new book, The Black Box Society: The Hidden Algorithms Behind Money and Information, Frank Pasquale forcefully argues that human beings are increasingly relying on computerized algorithms that make decisions about what information we receive, how much we can borrow, where we go for dinner, or even whom we date. Pasquale's central claim is that these algorithms will mask invidious discrimination, undermining democracy and worsening inequality. In this review, I rebut this prominent claim. I argue that any fair assessment of algorithms must be made against their alternative. Algorithms are certainly obscure and mysterious, but often no more so than the committees or individuals they replace. The ultimate black box is the human mind. Relying on contemporary theories of unconscious discrimination, I show that the consciously racist or sexist algorithm is less likely than the consciously or unconsciously racist or sexist human decision-maker it replaces. The principal problem of algorithmic discrimination lies elsewhere, in a process I label viral discrimination: algorithms trained or operated on a world pervaded by discriminatory effects are likely to reproduce that discrimination. I argue that the solution to this problem lies in a kind of algorithmic affirmative action. This would require training algorithms on data that includes diverse communities and continually assessing the results for disparate impacts. Instead of insisting on race or gender neutrality and blindness, this would require decision-makers to approach algorithmic design and assessment in a race and gender conscious manner. The Case Western Reserve Law Review published its symposium on the 20th anniversary of the Supreme Court's decision in Whren v. United States. My contribution is included. Here is the link for "Doubling Down on Racial Discrimination: The Racially Disparate Impacts of Crime-Based Removals." The Aoki Center for the Critical Study of Race and Nation and the Immigration Law Clinic recently won a derivative citizenship case on behalf of their client, Marianne Wilson Kuroda, who is born, raised and continues to live in Japan. Specifically, the Center and the Clinic argued that Mrs. Wilson Kuroda was born a U.S. citizen through her father, a U.S. citizen, based on Section 301(g) and 309(b) of the Immigration and Nationality Act (INA). [A] person born outside the geographical limits of the United States and its outlying possessions of parents one of whom is an alien, and the other a citizen of the United States who, prior to the birth of such person, was physically present in the United States or its outlying possessions for a period or periods totaling not less than five years, at least two of which were after attaining the age of fourteen years. The Center and the Clinic submitted evidence that Mrs. Wilson Kuroda's father legitimated her before she turned 21 years old. Evidence submitted include letters that her father sent to Senator Pat McCarran acknowledging Mrs. Wilson Kuroda as his child. These letters became the basis for a private bill that Senator McCarran introduced in June 1949 and that passed Congress in August 1950. Unfortunately, Mrs. Wilson Kuroda's mother died on the same day that the bill became law. Mrs. Wilson Kuroda and her father would never meet. However, the Center and the Clinic argued that Mr. Vaughn took sufficient steps under Nevada law to legitimate Mrs. Wilson Kuroda. 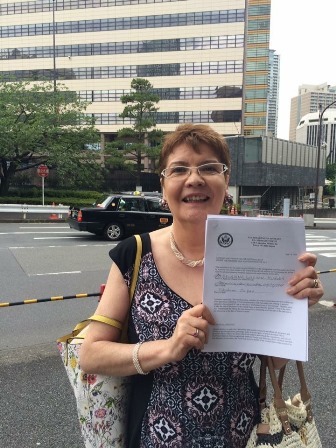 Thus, on January 5, 2016, with the assistance of the Center and the Clinic, Mrs. Wilson Kuroda filed an application for a U.S. passport at the U.S. Embassy in Tokyo. On June 6, 2016, the U.S. Embassy agreed and approved Mrs. Wilson Kuroda's application for a U.S. passport, essentially recognizing her as a U.S. citizen. Professor Leticia Saucedo and I worked on the case with David Canela ('16), J.J. Mulligan ('15), Emily Wilson ('13), and Andrea Wu ('15). In April, Curt Bradley and Jack Goldsmith wrote in The New York Times that the Justice Against State Sponsors of Terrorism Act (JASTA) then under consideration in the Senate - a bill that would make it easier for victims of the 9/11 terrorist attacks to sue Saudi Arabia - would violate international law and hinder United States' ability to claim sovereign immunity in other nations' courts. I argued in response that whether JASTA would violate international law was far from clear. Since then, the Senate passed a much changed version of JASTA. The revised bill would, among other things, create a new terrorism exception to the Foreign Sovereign Immunities Act (FSIA) for suits claiming damages for injury or death in the United States caused by the combination of an act of international terrorism in the United States and the act of a foreign state or official anywhere in the world. Curt and Jack write in a new post that this exception would harm US interests because (1) it might lead to unanticipated suits against countries other than Saudi Arabia, and (2) it will "create a broad precedent that can be used against the United States and its allies as an excuse for 'reciprocal' or 'analogous' reductions in immunity even if no suit is brought against those countries in the United States." They suggest that Congress could reduce the damage to US interests by limiting the exception to Saudi Arabia alone. Doing so, they write, "would confine most of the impact of the statute to US-Saudi relations and thereby minimize collateral consequences." I doubt that the more targeted statute Curt and Jack propose would help with either of the problems they identify. With respect to the foreign relations difficulties that suits under the new terrorism exception might cause, it is true that limiting the exception to Saudi Arabia would avoid the possibility of suits against other countries, but that possibility seems remote. It is hard to think of other countries whose acts contribute to international terrorism in the United States. And it hard is argue that any countries whose acts contribute to international terrorism in the United States should be immune from suit. On the other hand, singling out Saudi Arabia is likely to increase the affront to that country. With respect to the precedent such an exception might create for reciprocal legislation in other countries, it is hard to see how a statute targeted at Saudi Arabia alone would provide less of an excuse for reciprocal reductions in the sovereign immunity of the United States and its allies. If another country wanted to allow suits against the United States in its courts for "international terrorism," a US exception aimed at a single country would be all the precedent it would need. Indeed, even without JASTA, a precedent for such foreign legislation may be found in the United States' existing exception for state sponsors of terrorism which allows suits against Iran, Sudan, and Syria and which is not limited to terrorism in the United States. While I do not think that terrorism exceptions violate international law (Canada has one too), I do think they are problematic. As Curt and Jack wrote back in April, "terrorism is often in the eye of the beholder." It would not be surprising for the United States to find itself targeted someday by another country's terrorism exception to sovereign immunity. If Congress wants to reduce the adverse impacts on the United States that JASTA might cause, I would suggest another option. Rather than create a new terrorism exception to the FSIA, Congress might amend the territorial tort exception not to require that the "entire tort" have occurred in the United States. This was the option proposed in the version of JASTA that I wrote about in April, and it would be just as effective in removing sovereign immunity as a barrier to the 9/11 suits. The territorial tort option would have several advantages. First, as I explained in my previous post, the territorial-tort exception is well supported by state practice. Although US courts currently interpret the existing exception in the FSIA to require that the "entire tort" have occurred in the United States, it does not appear that customary international law requires this limitation. Building on the well-established territorial tort exception is likely to be less controversial internationally than expanding the more politically charged terrorism exception. Second, the territorial tort exception is subject to an important exception of its own for military activities during armed conflict. In 2012, the International Court of Justice (ICJ) concluded in the Jurisdictional Immunities Case (Germany v. Italy) that customary international law requires "that a State be accorded immunity in proceedings for torts allegedly committed on the territory of another State by its armed forces and other organs of State in the course of conducting an armed conflict" (para. 78). A number of the specific examples that Curt and Jack worried about in their April piece - like arming Syrian rebels or airstrikes against al-Qaeda and the ISIL - would fall in this category. Using the territorial tort option in JASTA would allow the United States to continue to claim immunity under customary international law for military activities even if JASTA eliminated immunity for non-military activities. Third, it is important to remember that the territorial tort exception is a territorial tort exception. The only countries that would be able to exercise jurisdiction over the United States reciprocally by enacting a similar exception are those countries in which tortious injury occurs. In April, Curt and Jack raised the possibility that the United States might become subject to suits based on financial support of Israel that results in displacing or killing Palestinians in the West Bank. But under the territorial tort exception, it is only the courts of the Palestinian Authority that would be able to exercise such jurisdiction. The territorial tort option would create no risk of expanded jurisdiction for torts in the courts of third countries. Of course, the same is technically true of JASTA's new terrorism exception, which requires an act of international terrorism "in the United States." But it is not true of the existing FSIA exception for state sponsors of terrorism, which contains no such limitation. If Congress is really worried about reciprocal legislation by other countries that might strip the United States of its sovereign immunity, the territorial tort option is a safer one than the terrorism option passed by the Senate. Although I am less concerned than Curt and Jack about the adverse impacts of passing JASTA, they have certainly identified some genuine concerns. The territorial tort option would be a better way of addressing those concerns than limiting the bill to Saudi Arabia. Whatever speculative damage to US relations with other countries might be avoided by limiting the bill as Curt and Jack suggest is likely to be more than offset by the offense that singling out Saudi Arabia would cause. As for the precedent that JASTA would set for reciprocal legislation in other countries, a territorial tort exception would build on a firmer foundation, exempt military activities, and be territorially limited in ways that a terrorism exception - even one limited to a single country - would not. Reynoso: I’m Mexican-American, and I was a judge. What Trump is doing is appalling. Former California Supreme Court Justice and Professor Emeritus Cruz Reynoso penned an op-ed for PostEverything, a feature of The Washington Post. The piece is titled "I'm Mexican-American, and I was a judge. What Trump is doing is appalling." In it, Reynoso takes on remarks from presumed Republican presidential nominee Donald Trump, who wishes to disqualify U.S. District Judge Gonzalo Curiel from presiding over the lawsuits against Trump University: "Now, this judge is of Mexican heritage. I'm building a wall, okay?" Trump's rhetoric is a frontal attack on the judicial system. Are federal judges of Hispanic origin to be judged on the basis of their ethnicity rather than that the quality of their professionalism? I have had the opportunity these last 53 years of my life to be a lawyer who practiced before judges, as well as a judge - a California state appellate and Supreme Court justice. (I was proud to be the first Latino appointed to my state's highest court, in 1976.) When appellate judges disagree, they write dissents. Dissents are based on differing views of the law. Never has a dissent been based on the ethnicity of disagreeing justices, nor should it be so. Were that true, as Trump asserts, our judicial system would, in effect, be destroyed. For the full op-ed, visit PostEverything. I recently joined PublicSquare.net for a debate on its program Scholars Mate. The topic was U.S. v. Texas, a major Supreme Court case involving immigration and executive power. Here is the video. Thanks to PublicSquare.net for the opportunity!